During her residency at the Institut de l'Audiovisual of the Universitat Pompeu Fabra (Barcelona), Israeli Barcelona-based artist Orit Kruglanski, a graduate of the Tisch ITP program in New York City, developed a wide variety of interactive poems from Palm poems to sound poetry. WhereAbouts starts with an image from the Barcelona "Example" (the central part of the city that was designed by Cerdà in the nineteenth century and long considered the paradigm for big cities in Europe). Kruglanski establishes a relation between the empty space and the appearance of text, and at some point, the reader discovers that not only can she read, but she can also provoke the circulation and dissolution of the lines. 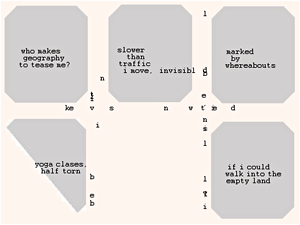 Additionally, the interactive reader realizes that she can design a new city by moving the street blocks and the associated lines, creating in the process a totally new poetic geography. Author description: WhereAbouts is an interactive poem about urban life. It juxtaposes planning and order with movement and chaos. The neatly planned and perfectly ordered design of poetry in the form of short verses gives way to the busy ant-like rush of letters in the changing streets designed by the reader, as she drags around the "example" blocks as she pleases. The planned and recognizable city now disappears, and another city emerges, one composed of the bustle of the letters that inhabit it, even as they hurry to leave the screen. Previous publication: First appearance online in 2003.